On Saturday, April 26th Harbor East one of Baltimore's chicest retail locations will be hosting a huge fashion event in its streets as some of the areas most notable retailers will be highlighted. Guest are encouraged to come down and shop with their favorite stores and explore a few new ones while taking advantage of FashionEasta in store promotions and style events. During the event patrons are welcome to dance and groove to live entertainment, sip on cocktails and enjoy light fair being served street side from some of Harbor East's best restaurants. The whole event will culminate at 3:30 when local celebrity guest models including Baltimore Ravens player Lardarious Webb and WJZ Traffic Reporter Sharon Gibala take the runway in some of this springs hottest fashion looks from featured Harbor East stores for the FashionEasta Fashion show. Who will be featured you ask? How about Urban Chic, South Moon Under, Under Armour Brand House and MAC Cosmetics just to name a few. No matter your style the FashionEasta fashion show will surely provide you with inspiration to help you spruce up your spring wardrobe. And just think if you see that must have piece on the runway, it can be yours in a matter of moments because everything you see will be right there and your finger tips and with the in store specials, you'll be walking away with a great deal! Still think this is some little event you can pass up? Check out the video from last year! 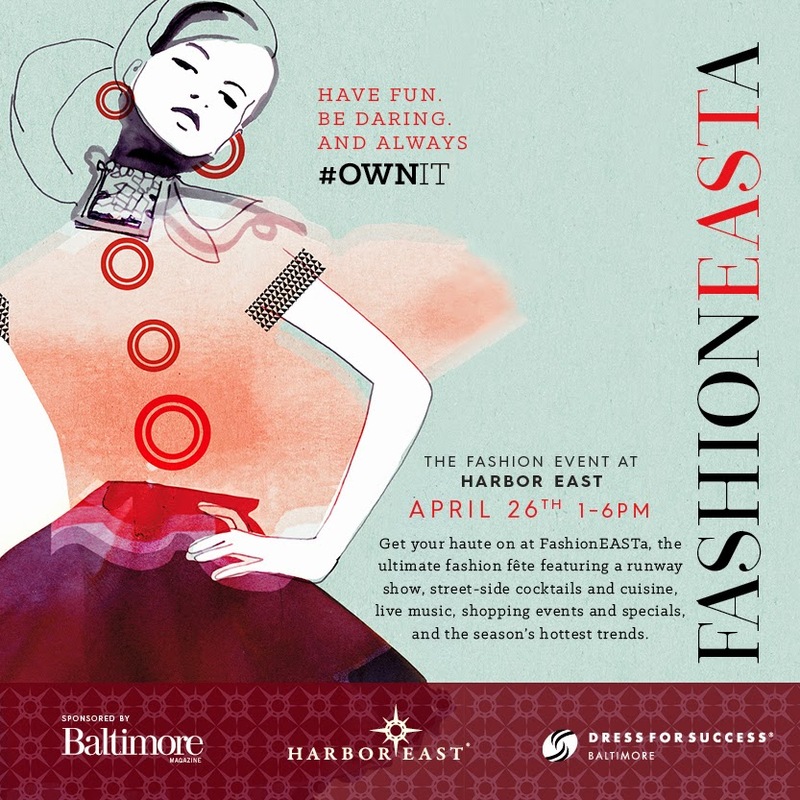 If your here in Baltimore and you're serious about fashion and fun there is only one thing you should be doing on Saturday, April 26th at 1pm... and thats joining me at Harbor East's FashionEasta event! Oh and did I forget to mention the best part of all.... Entry to this amazing event and fashion show is completely free. Now if you want to go the VIP route and get access to reserved seating for the fashion show (so you can get an up close and person look at Lardarious lol), an exclusive FashionEasta shopping bag, discounted refreshments and garage parking feel free to click HERE to purchase your guest list tickets for only $35.00. A portion of the proceeds from ticket sales benefit Dress for Success Baltimore a foundation helping women reenter the workforce and succeed in their fields. Also if your in the giving mood, when you come down to the FashionEasta event to pick up your new spring fashions be sure to bring some of you gently worn women's business attire that you no longer wear, as Dress for Success Baltimore will be accepting donations during FashionEasta. I mean look at it this way, it makes room in your closet for new pieces while helping another woman's future. BONUS- every donation will automatically enter you to win a "Harbor East Experience" prize package valued at $500.00. So don't forget to visit the Dress for Success booth to drop off your donation items and for full contest details. You can also visit their site HERE. Ok, so lets do this one more time. Saturday April 26th on Aliceanna Street (between S. Exeter and S. President St) at1pm YOU need to be at what promises to be one of the chicest fashion events of the year! Oh and if you see me out and about sipping and shopping don't be shy! Come on over and say hi! I'm sure ill be bubbling with excitement and of course I would love to talk fashion & fun and even give advice on this springs hottest trends if you need it! Be sure to check out Harbor East on the web HERE and follow them on Instagram @harboreast tell them I sent you! Below you will find more details about Harbor East's FashionEasta Event!